Buses No. 5, 22, 44, 45 and 83 run from the airport to Lisbon’s central bus terminal several times an hour. The 30-minute trip costs just over a Euro. The Aerobus runs 07:00 - 23:00 between Lisbon Airport and the Baixa district until Cais do Sodré. Tickets, which are also valid on Carris trams and buses on the same day, can be bought on board or at the Aerobus desk in the Arrivals hall. 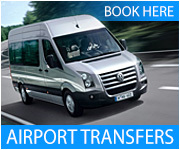 The fastest, most convenient and comfortable way of getting between your accommodation and the airport, however, is an airport transfer.